Click on picture for enhancement. While it's true the Rune sprung from the fertile minds of Honda's futurist designers, shades of this revolutionary machine were seen in real steel nearly 10 years ago. 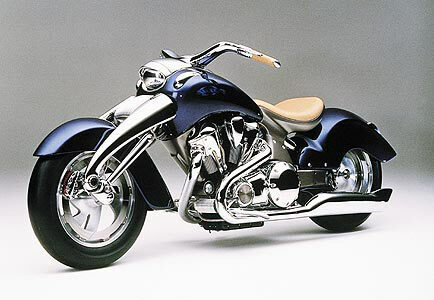 The Rune traces its lineage back through a line of concept vehicles all the way to 1995, when Honda revealed the radical Zodia at the Tokyo Motor Show. The Zodia was an innovative concept cruiser, a high-tech custom showcasing engineering concepts never seen in production, and styling that blended elements of classic retro lines with new-age futuristic technology. Some of the Zodia's more shocking design elements, such as the trailing-link front suspension and single-side swing arm, are now seen in the Rune. The Zodia's sensuous body lines wrapped around many other unique features. Powered by a 1500 cc maintenance-free overhead camshaft V-twin, the Zodia transferred engine power to the rear wheel via Honda's innovative hydro-mechanical automatic transmission, the HFT (Human Fitting Transmission). Braking was supplied by unique rim-mounted brakes assisted by Honda's latest generation of Linked Braking and Antilock Braking System.